Monsoon brings life to the nature & streams and it is the best season to explore gorgeous waterfalls in India. India has numerous beautiful waterfalls spread across different regions. South India (especially Karnataka) is home of several breathtaking waterfalls. 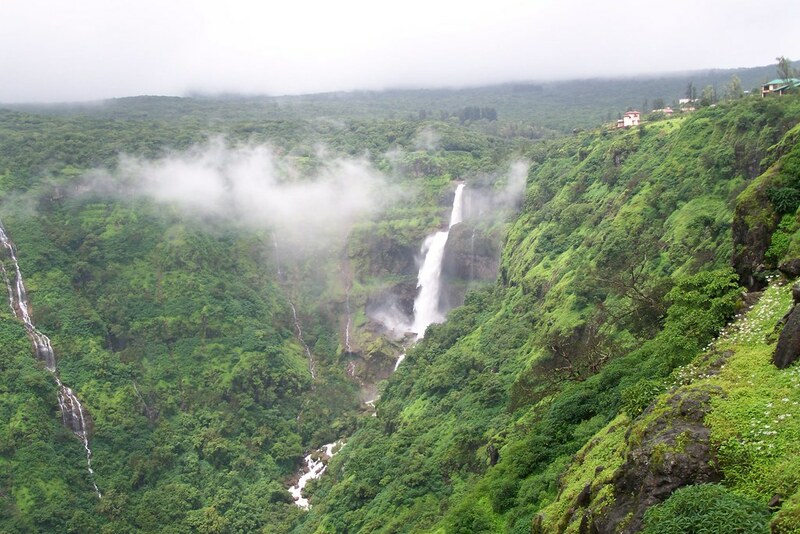 Maharashtra has some stunning waterfalls which can be visited only in the monsoon season. Trawell.in presents 20 most beautiful waterfalls in India one must visit to experience the miracles of nature. Nohkalikai Falls is the most famous waterfalls in Meghalaya and is located near Cherrapunjee. Falling from a height of 1115 feet (340 m), Nohkalikai Falls is the tallest plunge waterfall in India and fourth highest in the world. It is dropping from a plateau that receives the highest rainfall in India. The flow of water is profuse in summer while it recedes in the winter to a small stream giving the impression of a white rope against the green backdrop. Nohkalikai Falls is one of the best waterfalls in India and is a beautiful place to visit in Cherrapunjee. Living Root Bridge, Mawsmai Cave, Seven Sisters Falls, Mawkdok Dympep Valley, Eco Park, Sa-I-Mika Park, Mawmluh Cave, Kynrem Falls, Wakaba Falls, Don Bosco Shrine and First Presbyterian Church are some of the tourist places to visit in Cherrapunjee. The waterfall can be seen from a distance from the viewpoint on the opposite hilltop. There are steps, which take tourist down to various other viewing points. The best time to visit the Nohkalikai Falls is in the months of September and October when the skies are relatively clear. 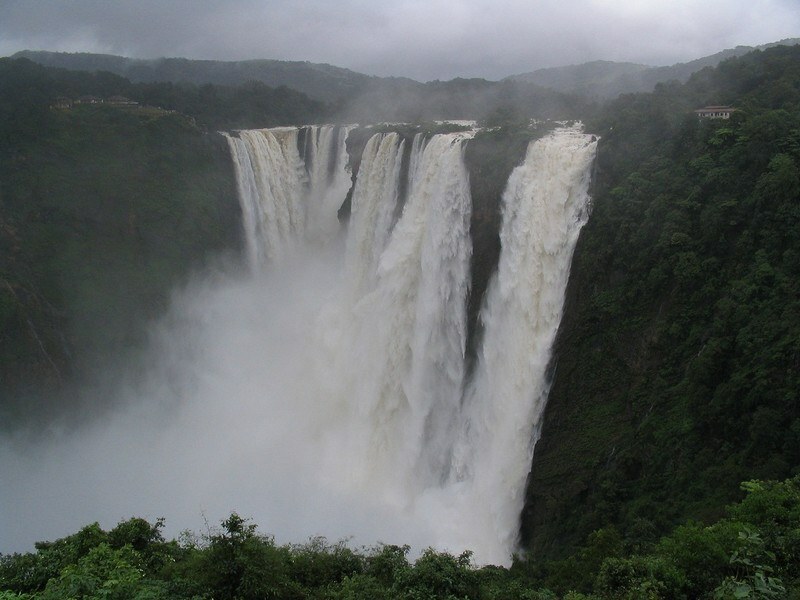 Jog Falls is the one of the highest plunge waterfall and also one of the best among India waterfalls. It is situated in Shimoga district of Karnataka State and is locally known as Gersoppa Falls and Jogada Gundi. This is formed over the Sharavathi River falling from a height of 253 m (830 feet). The Sharavathi River flowing over a rocky bed about 250 yards wide and 253 m deep creating four distinct falls known as Raja, Rani, Rover and Rocket. In monsoon, the four cascades merge to form the huge waterfall. The Raja Fall pours in one unbroken column sheer to the depth of 830 ft. Jog Falls can be seen in gorgeous form in rainy season in July, August & September and it is one of the top monsoon destinations in India. Jog falls is one of the most beautiful waterfalls in Karnataka and is one of the best place to experience the Karnataka Tourism in Monsoon. There is a viewpoint near parking area which also has few shops available. A narrow path from viewpoint leads to bottom of the falls. The walk is steep & little difficult and takes about 45 minutes one way. The view is amazing from the bottom and the showering sizzles of the falls at bottom are really worth the effort. However, the path is slippery and little dangerous during peak monsoons. Kudumari Waterfalls, Unchalli Falls, Koosalli Waterfalls, Bennehole Falls and Murudeshwar are some major attractions near Jog Falls. 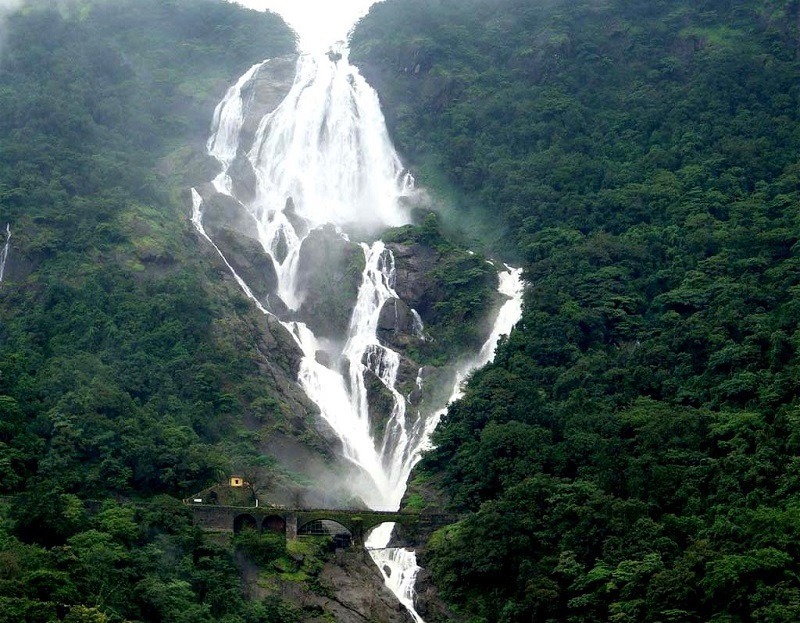 Dudhsagar Falls is the largest & highest waterfall in Goa. 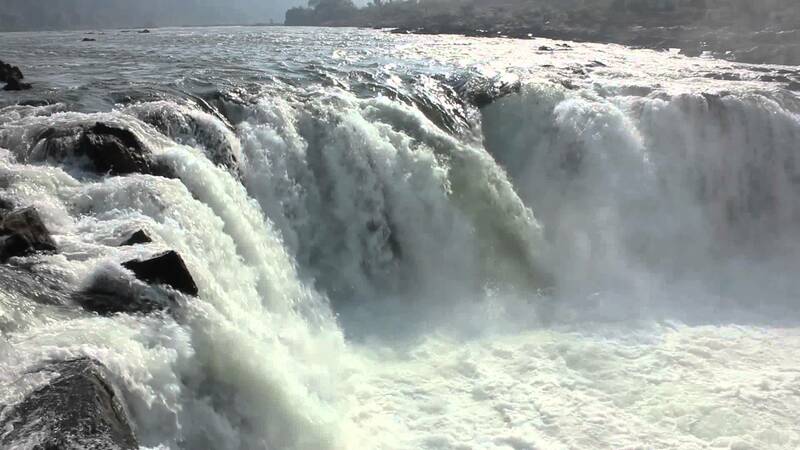 This is a four tiered waterfall formed by the Mandovi River in Goa. This waterfall is among tallest waterfalls in India with a height of 310 m (1017 feet) and an average width of 30 m (100 feet) at its peak. This fall is located inside the Bhagwan Mahavir Sanctuary, at the border between Karnataka and Goa states. It is one of the best places to visit in Goa as part of Goa tour packages and also a top monsoon destination. Trekking to the waterfall is also a popular activity. There are three trekking routes which start from Kuveshi village, Castle Rock railway station and Kulem railway station. Another, more popular approach is to reach the middle of the Dudhsagar waterfalls through the railway tracks. One can travel in a passenger train from Margao to Kulem to reach the tracks in middle of the waterfall. Own vehicles are not allowed into the sanctuary to reach the waterfall. The most common and easiest way to reach the waterfall is to take forest department jeeps from the forest entrance and hike one km distance from the dropping point. This service is closed during monsoon (June – mid October). Barehipani Falls is an enchanting waterfall located in Simlipal National Park in Mayurbhanj district of Odisha. 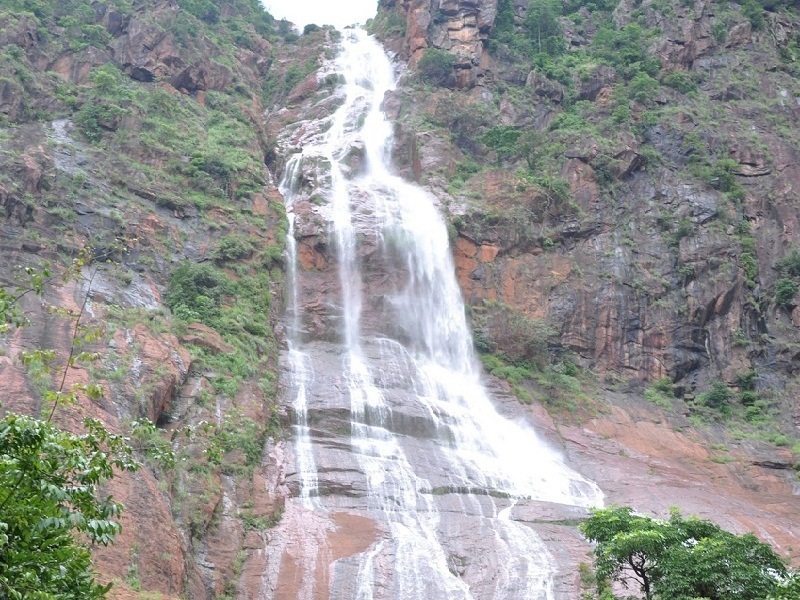 It is one of the highest waterfalls in India and Odisha’s highest waterfall. The waterfall is created by the Budhabalanga River on its course over the Meghasan Mountain. The height of the waterfall is 399 m (1309 feet). It is a 2 tiered waterfall and the tallest single drop is 259 m (850 feet). This flowing cascade of water gushes out from a wide cliff. The entire course of the fall right from the cliff to the pool is breath taking. This waterfall can be viewed all through the year, though monsoon & post-monsoon is the best season. Located amidst natural surroundings, the Barehipani Falls allow the tourists to enjoy its appalling beauty in a calm and serene atmosphere. It is a major tourist attraction and a large number of tourists come to visit this falls every year. Barehipani Fall is located within Simlipal National Park, which is famous for housing animals like Bengal and White Tiger. The other tourist spots located close to the falls are the Joranda Waterfalls. The best time to visit the fall is from September to December. 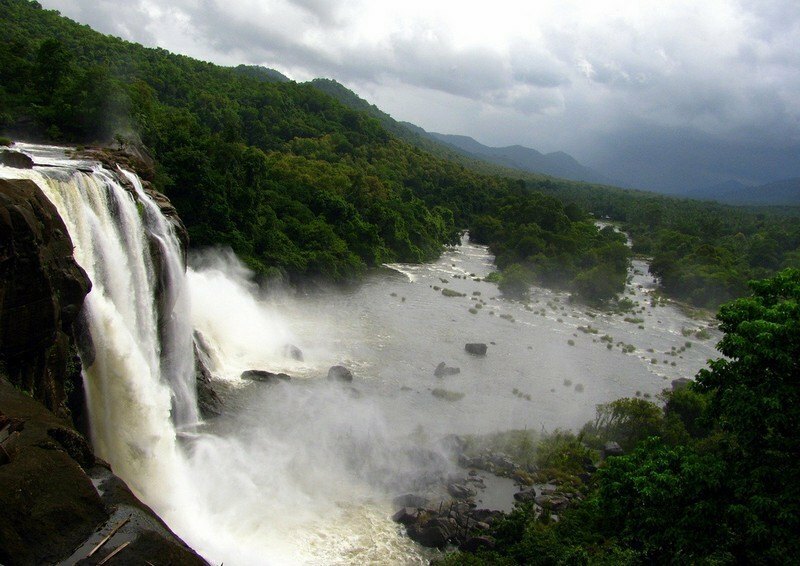 Athirapally Waterfalls are one of the top waterfalls in India and one of the top Kerala tourist places. Athirappilly Falls are magnificent waterfalls formed on Chalakudy River located at the entrance to Sholayar hill range in Thrissur district. 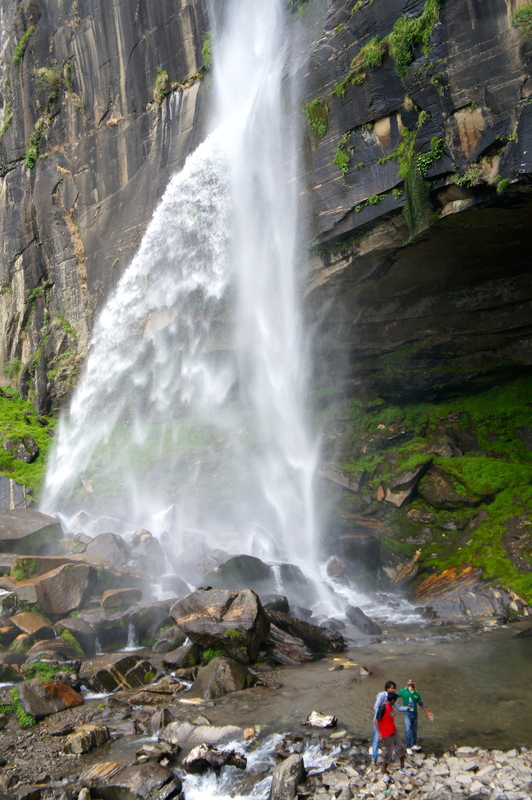 This waterfall drops from a height of 80 feet through several parallel streams offering a great scenic beauty. In monsoon season, the water gets strength and all the streams join together and appear like Niagara Falls. This is the biggest waterfalls in Kerala and one of the top places to visit in rainy season in the months of June, July & August. One can reach top of the falls with about 15 minutes’ walk from the falls entrance. It offers spectacular views of the Sholayar hills and a unique view of the waterfalls from this spot. About 10-15 minutes trek down from top of the falls will take you to bottom of the falls where the greatest beauty of the falls can be experienced. Swimming is possible in the stream at bottom of the falls. The Vazhachal Waterfalls, Chapra Falls, Anakkayam, Sholayar Dam, Valparai and Malayattur Wildlife Sanctuary are some popular places to visit during Kerala tour. It also offers adventure activities like river rafting, trekking, etc. Kempty Falls is a fascinating waterfall located on Mussoorie-Yamunotri Road in Mussoorie. This is one of the best among Uttarakhand waterfalls and also among the popular tourist places in Uttarakhand. Situated at an altitude of 4,500 feet, it offer a remarkable view as the water dropping from a height of about 50 feet flowing through five cascading falls in the downstream. There are two main falls in Kempty with water falling into big pools. The lower waterfall is very popular and attracts large crowd while the upper one relatively calm. Kempty Falls is one of the four waterfalls appeared on Indian Stamps. Mussoorie is among the popular hill stations in India and also one of the best places to visit near Delhi. 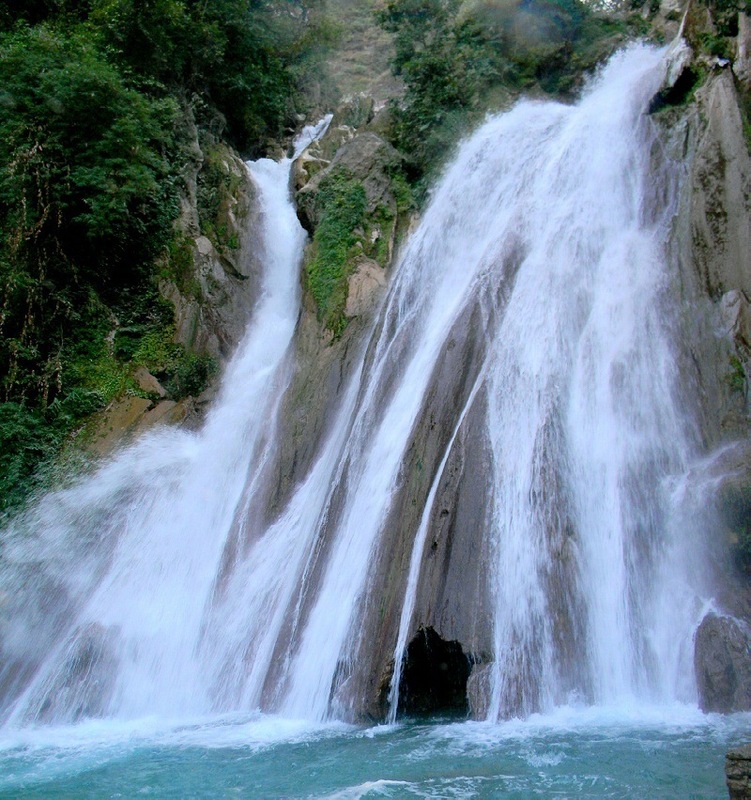 Kempty Falls is another popular attraction not to miss in a Mussoorie tour packages. The falls are close to the main road and the first waterfall can be reached by about 5-10 minutes’ walk from the road. The second waterfall can be reached by further walk or through a roadway from the main road / first waterfall. Tourists can also reach other cascading parts of the falls by climbing down from the second falls. Visitors can enjoy the refreshing bath under fall and one can also enjoy boating in the nearby man-made pond. Lal Tibba, Cloud’s End, Christ Church, Happy Valley / Tibetan Buddhist Temple, Mall Road, Company Bagh / Municipal Garden, Camel’s Back Road and George Everest’s House are some popular tourist attractions to be visited as part of Mussoorie 2 day trip. The best time to visit Kempty Falls is during monsoons from July to October. Shivanasamudra is a famous waterfall situated in Mandya district of Karnataka. This is one of the best waterfalls near Bangalore on Kaveri River and also one of the top waterfalls in India. The island of Shivanasamudra divides Kaveri River into two parts that form two waterfalls, one is Gaganachukki and the other is Bharachukki. These are collectively called as Shivanasamudra Falls though Gaganachukki is most commonly represented as Shivanasamudram Falls. This is one of the top monsoon getaways from Bangalore and also one the best places to experience the Karnataka Tourism as part of Bangalore 1 day trip. Shivanasamudra Waterfalls is another popular attraction not to miss in a Mysore tour packages. Gaganachukki includes a huge horsetail shaped waterfall dropping from a height of 90 m and two large parallel streams that cascade down through a rocky bed from a height of over 320 feet. Bharachukki is situated at distance of approximately 1 km from the Gaganachukki (Dargah point). The cascading edge of Bharachukki is a little wider and is a cascading fall with a height of 70 m forming several streams through the wide rocky formations. Though geographically both the falls are adjacent, the viewpoints of these falls are about 15 km away. The Gaganachukki waterfalls are best viewed from the Shivanasamudra watch tower. Talakadu, Somnathpur and Mysore are the some tourist places nearby. 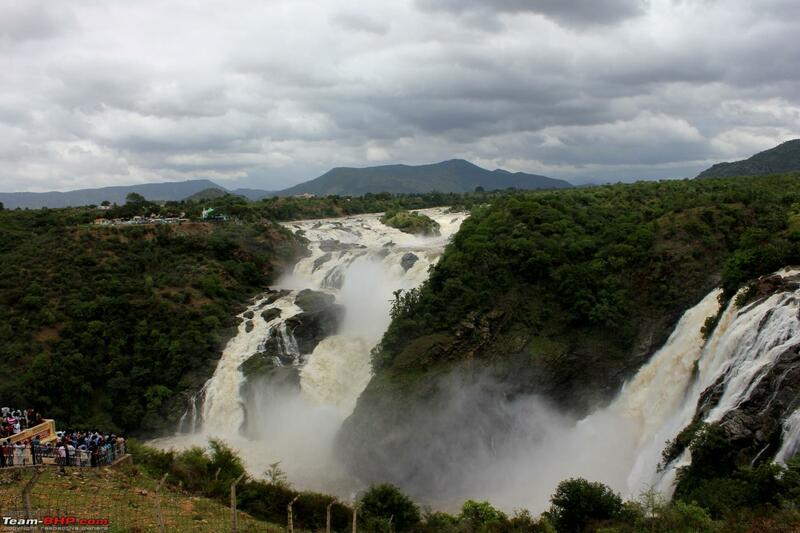 August to October is the best season to visit Shivanasamudra Falls. Nuranang Falls, also known as Bong Bong Falls, is located in Tawang district of Arunachal Pradesh, India. It is one of the most spectacular waterfalls in Arunachal Pradesh and also one of the most attractive waterfalls in India. It lies about 2 km away from the town of Jang, so it is also known as the Jang Falls. Situated at an altitude of 6000 feet, the Jang Falls is cascading down from a height of 100 meters. Originating from northern slopes of the famous Sela Pass, Nuranang River forms the waterfalls and then plunges into Tawang River. 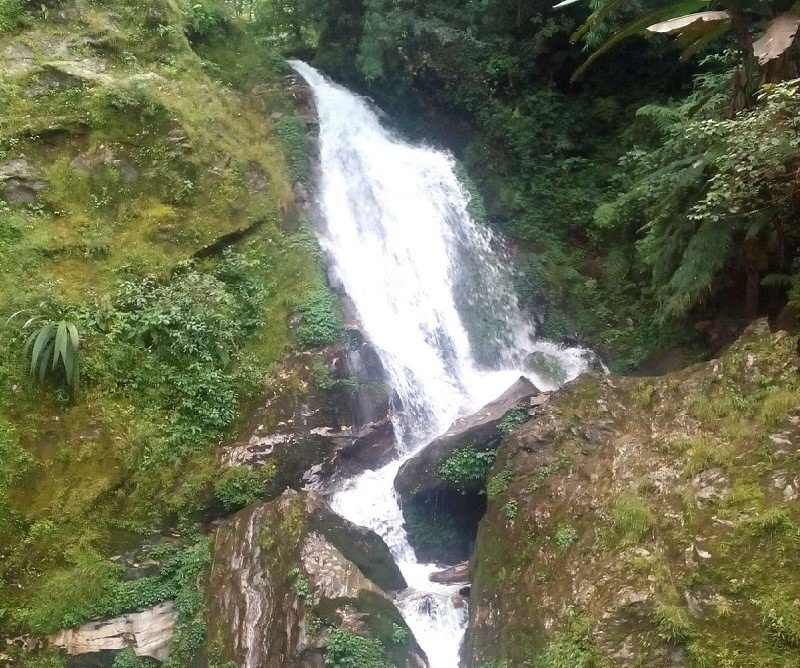 Jang Falls is very scenic place located 30 km before Tawang on the Bomdilla-Tawang route. Regular bus service is available from Tawang to reach Nuranang Falls. Visitors will need to walk down a good number of steps from the road to reach the falls. These waterfalls shot to fame after the shooting of one of the songs Tanhai Tanhai of Shahrukh Khan and Madhuri Dixit starrer Bollywood movie Koyla in 1997. Tawang Monastery, Sela Pass, Bum La Pass, Madhuri Lake, Taktsang Gompa, Pankang Teng Tso Lake, Shonga-tser Lake, Jaswant Garh, Gorichen Peak and Bap Teng Kang Waterfalls are other popular tourist attractions near Nuranang Falls. The best time to visit the falls is from August to October. 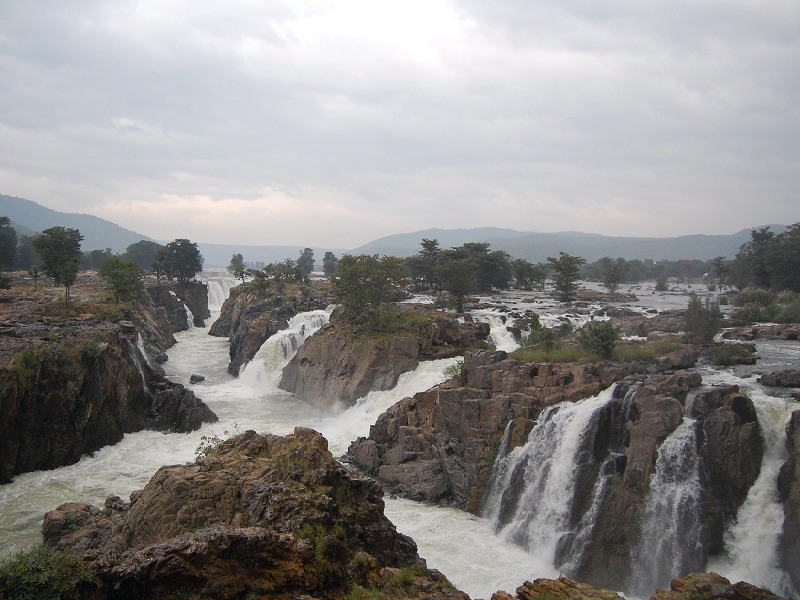 Hogenakkal Falls is a beautiful waterfall on Kaveri River located in Dharmapuri district of Tamil Nadu. It is one of the best Bangalore monsoon getaways and one of the popular waterfalls in India. Sometimes referred to as the ‘Niagara of India’, it is also among the best places to visit in Tamilnadu and also one of the top places to visit as part of Bangalore 1 day trip. 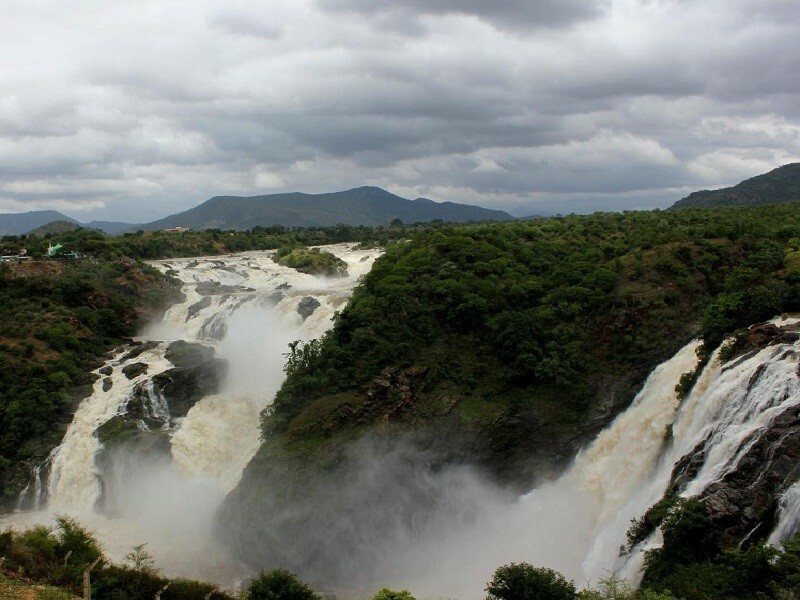 When the River Kaveri enters Tamil Nadu border after winding its way through the state of Karnataka, it descends down the lofty landscape forming the Hogenakkal Waterfalls. The falls has about 14 channels with drops varying between 15 & 65 ft.
To reach the surroundings of waterfalls one needs to take a boat-ride (there is no land access). Coracle riding is one of the main attractions here which is allowed during the monsoon and winter season. Boating is usually stopped in peak monsoons. Hogenakal Falls is also the good place to try out your swimming skills. 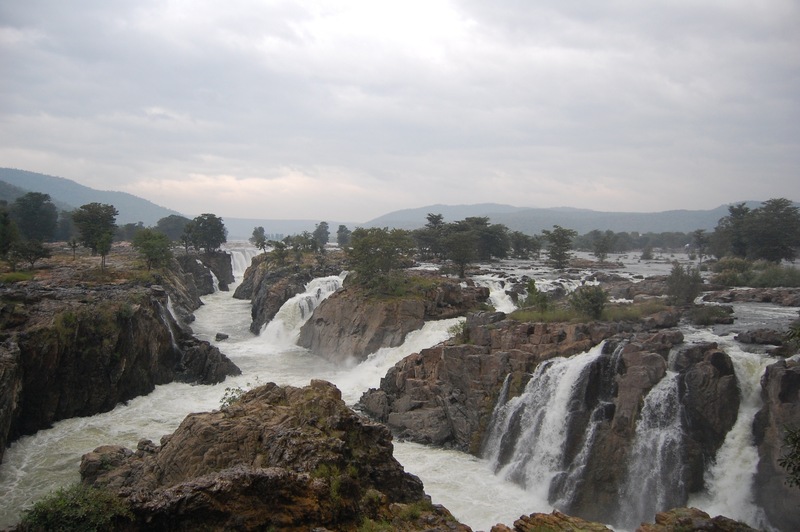 The best time to visit Hogenakkal Falls is from July to October while the peak season is from August to September. 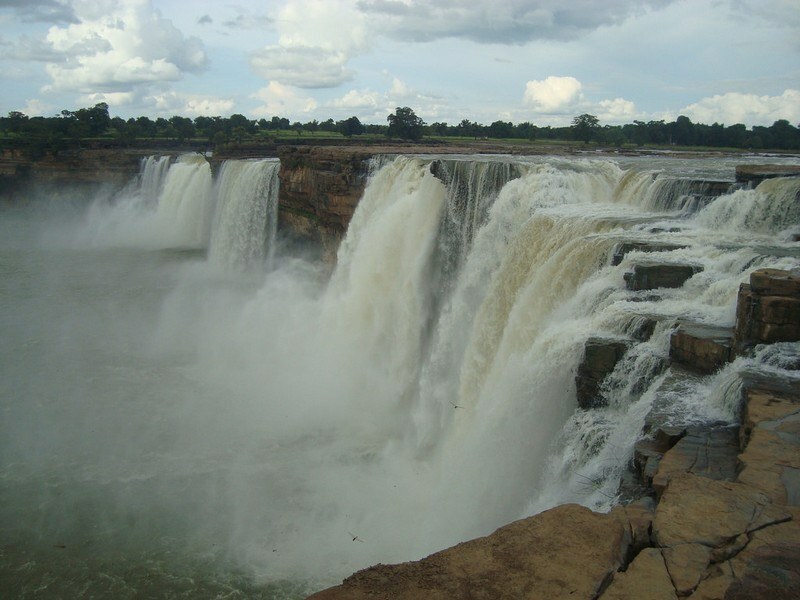 Chitrakote Falls is a magnificent waterfall located to the west of Jagdalpur in Bastar district of Chhattisgarh. The waterfall is formed over Indravati River and it has a height of around 96 feet. It is the broadest waterfall in India and is considered to be the Niagara Falls of India, owing to its horse-shoe shape. It is one of the best places to visit in monsoon season in India. During rainy season, the falls cover the entire stretch of the horseshoe covering a width of about 300 meters. The area around the Chitrakot Falls is highly dense and forested. In the pool below the falls, swimming and boating are allowed. On the left bank of the Chitrakot Falls, a small Hindu shrine dedicated to the god Shiva and several naturally created grottos named Parvati caves are located. Thirthgarh Waterfalls is another popular tourist attraction near Chitrakote Falls. Dhuandhar Falls is a stunning waterfalls located at Bhedaghat in Jabalpur district of Madhya Pradesh. 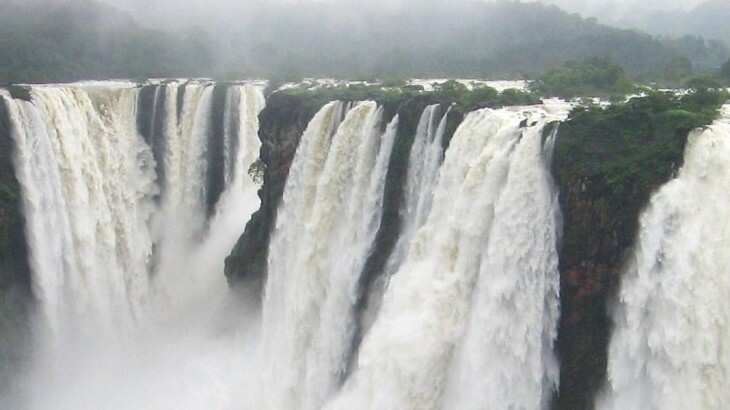 It is one of the popular attractions in Madhya Pradesh and among the top waterfalls in India. 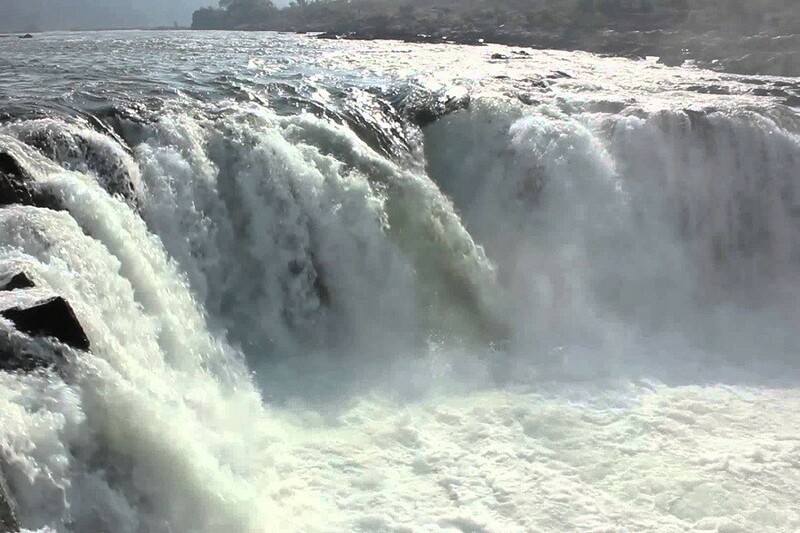 Dhuandhar Falls is formed over Narmada River and is dropping from a height of 98 feet. The water of the cascades create a milky fog during their descent from the famous marble rocks, which gives the name Dhuandhar. In Hindi, Dhuan means smoke and Dhar means flow. The water flow of the Dhuandhar Falls is quite high in monsoon season. Dhuandhar Falls have two access points i.e. east coast and west coast. To the east is the town of Bhedaghat and to the west is the cable car service. Marble Rocks, located just one kilometer from here is also worth seeing. Boating is an amazing experience, especially by the moonlight. The white marbles appears spectacular when the moon light falls on it and gives it a silver appearance. Boating facilities are available from November to May. Balancing Rocks, Chausat Yogini Temple, Tiger N Woods Forest Resort, Dumna Nature Reserve, Bastar Palace, Madan Mahal Fort and Bargi Dam are other beautiful places near Dhuandhar Falls. September to March is the best time to visit the falls. Langshiang Falls is a popular waterfall situated near Sangriang village in West Khasi Hills district of Meghalaya. 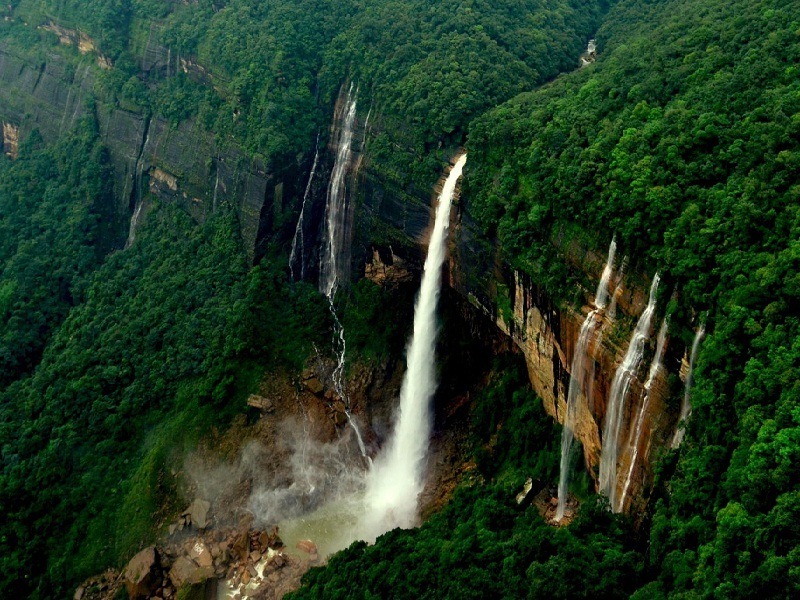 It is the third highest waterfalls in India and one of the famous waterfalls in Meghalaya. It cascades down from a height of 1100 feet (337 m) and is created by River Kynshi. 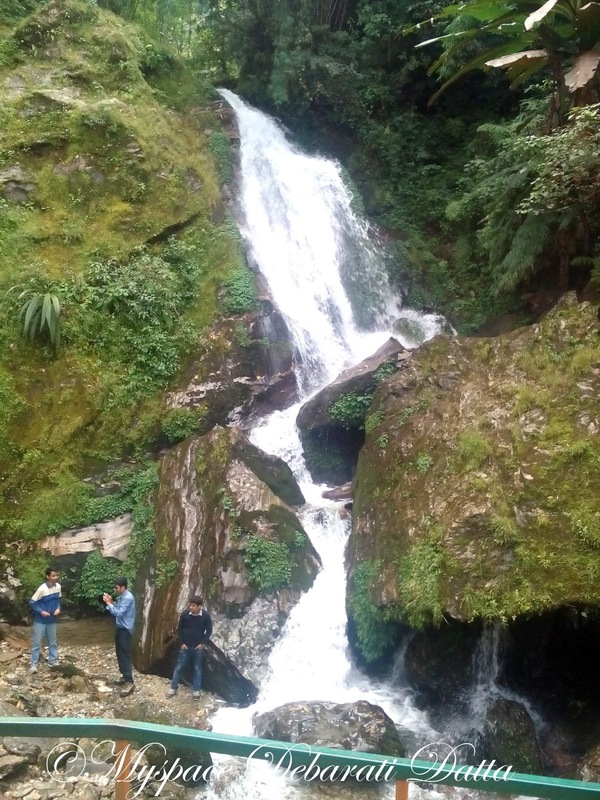 The waterfall is formed when two different streams of River Kynshi meet near Sangriang. It offers the best panoramic views of the green lawn hills nearby and surrounding hamlets. The best view of this fall can be perceived from the village of Mawpon. Langshiang Falls is 1 km south of Mawpon village. The vibrant colours of the setting sun on the waterfalls make it beautiful. This is a perfect holiday spot for the tourists as it is surrounded by scenic beauty all around. The falls is at its best during the monsoons when the river has abundant flow of water. Langshiang Falls is located close to Nongkhnum Island, the biggest river island in Meghalaya and the second largest river island of Asia. The other waterfalls located near Langshiang Falls are Wei Spi falls and Kshaid Chong falls. 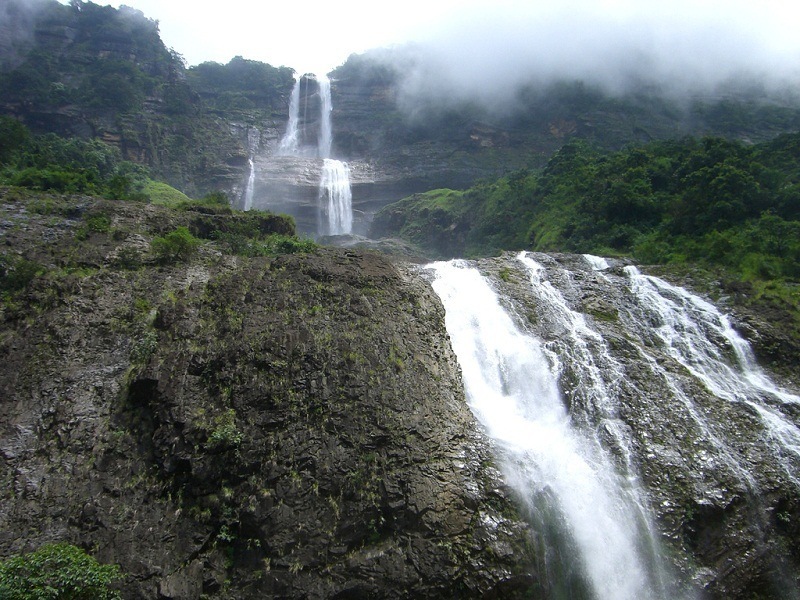 Jakrem, Kyllang Rock and Mawsynram are the other nearby attractions to Langshiang Falls. Courtallam is a small town located in the district of Tirunelveli in Tamil Nadu. 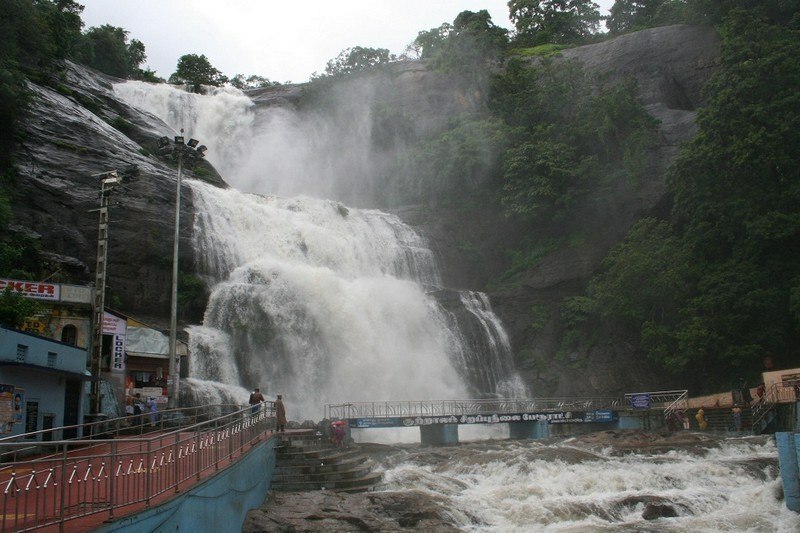 Also known as Kutralam, it is well known for Courtallam Falls which is one of the most famous waterfalls in Tamilnadu. The waters of Courtallam are believed to have medicinal qualities as it flows through forests of herbs. There are nine waterfalls at Courtallam where the River Chittar cascades over 92 meters at varying volumes. Courtallam is the one of the best places to visit in monsoon as part of South India tour packages. The Main falls or Peraruvi is the most popular and the biggest among the nine falls. Falling from a height of 60 m, it is located right inside Courtallam town. The flow of water is interrupted by the Pongumakadal rock and comes down gently making it a safe place to bath. The Kutralanathar Temple, dedicated to Lord Shiva is located near this falls. Road access is available close to the falls. Chitraruvi or Small falls is situated just above the Main falls. Shenbagadevi falls, Thenaruvi, Five Falls, Palaruvi Falls, Thirumalapuram Rock Cut Cave Temples and Thenmala Dam are other important tourist attractions in and around Courtallam. Irupu Falls is a magnificent waterfalls situated in Brahmagiri Hills between Srimangala & Kutta in Coorg district of Karnataka. It is one of the most beautiful Karnataka waterfalls and also one of the top tourist places in Karnataka. Locally known as Lakshmana Tirtha Falls, it is formed by Lakshmana Tirtha River, a stream originated in Brahmagiri Hills and joins Kaveri River. Dropping from a height of 170 feet through several stages, the falls are situated amidst thick forest of western Ghats and offers great views of the nature. This is one of the popular 2 day trip from Bangalore and among the top attractions you must include in Coorg packages. Iruppu falls is part of the Brahmagiri forest range, there is a trek route that leads to the Narimale forest camp and then on to Brahmagiri peak. Permission from forest department is needed for doing this trek. There is a temple called Rameshwara Temple dedicated to Lord Shiva is located on the banks of the Lakshmana Tirtha River, enroute to the falls. Wayanad Wildlife Sanctuary -Tholpatty, Nagarhole National Park, Thirunelly Temple, Pakshipathalam and Kuruva Island are the some popular tourist attractions near Irupu Falls. 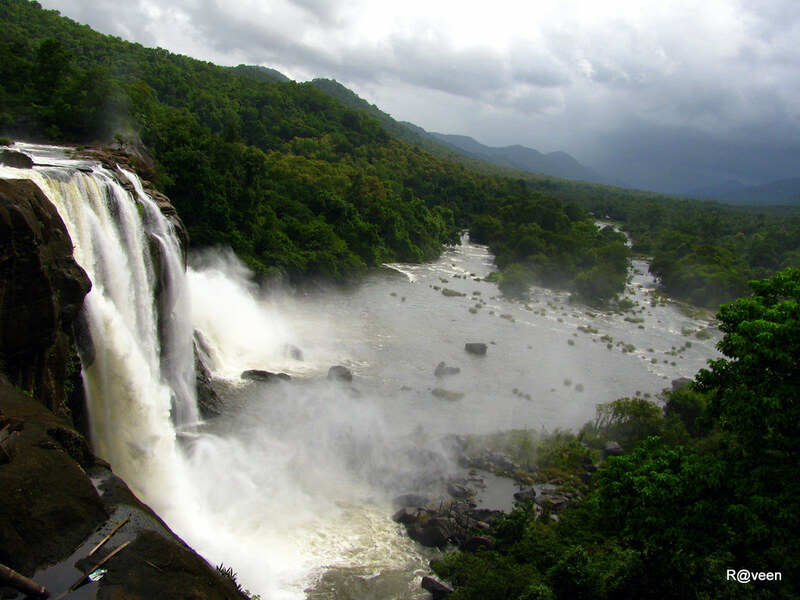 The best time to visit Iruppu falls is from August to January while the peak season is from September to December. Vajrai Falls is a picturesque waterfall located near Kas Flower Valley and the Sahyadri Hills in Satara district of Maharashtra. This is one the most spectacular waterfalls in Maharashtra and also one of the highest waterfalls in India. This three tier waterfall is dropping from a height of around 853 feet (260 m). Vajrai falls is also the birthplace of Urmodi River. This is one of the top places of Satara sightseeing. 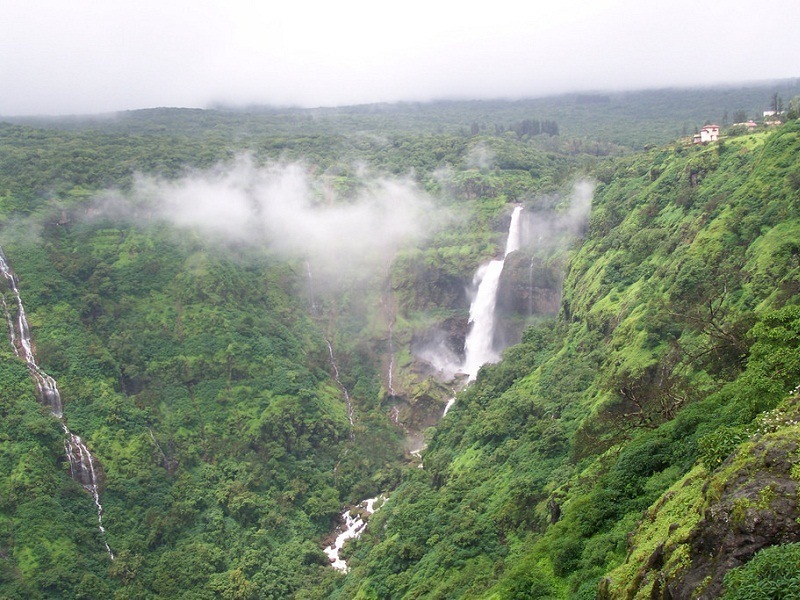 Satara can be visited along with Panchgani and Mahabaleshwar as part of Mahabaleshwar Tour Packages during monsoon. The Vajrai Falls is a perennial waterfall but is very spectacular during monsoons. People from different parts of Maharashtra flock to this falls during the monsoons to watch the beautiful flow of the stream. There are many small caves near Vajrai Falls which can be visited along with the falls. There are several attractions near Vajrai like Urmodi dam, Thoseghar Waterfalls, Kas Flower Valley, Chapal Vir Maruthi Temple, Ajinkyatara Fort and Sajjangad fort which attract many tourists. Boating at Tapola is another major tourist attraction here. The falls is situated near Bhambavali village in Satara district. One can reach the falls by using personal vehicle or Alawadi Bus from Satara Bus Stand. The 500 m long trek path leading to the base of the waterfall is quiet adventurous but risky in monsoon. This area is inhabited by large number of leeches. Khandadhar Falls is a perennial waterfall located at Nandapani in Sundergarh district of Odisha. 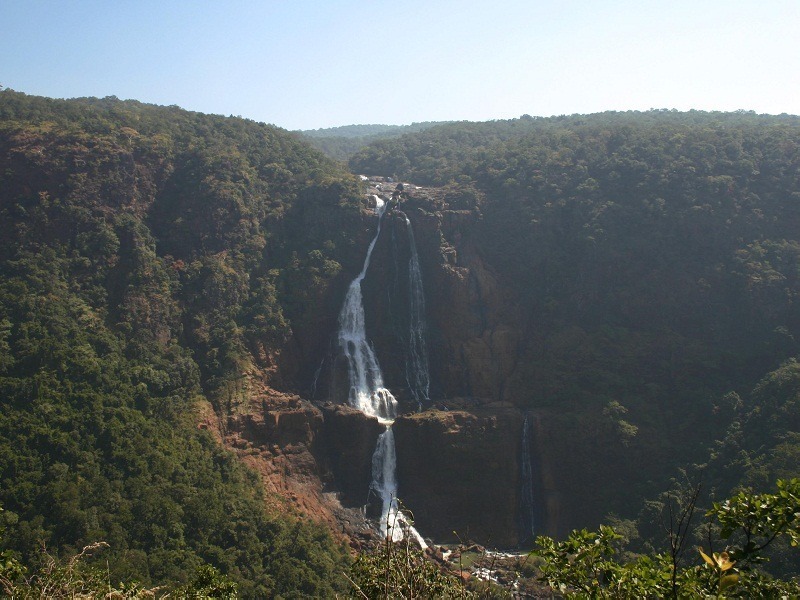 It is the 12th highest waterfall in India and 2nd largest waterfall in Odisha. Khandadhar Falls located amidst lush greenery of unpolluted forest, drops from a height of 244 m and is created by a perennial rivulet named as Korapani Nala. The beauty of this glittering waterfall multiplies during the monsoon when the water from the rivulet overflows and it drops down as a fall from a height of 800 feet. Hiking and trekking is undertaken by adventurous tourists to view the waterfalls from the top of the hill. Khandadhar waterfalls is located amidst the forest of Sundergarh. Sanaghagara waterfall, Murga Mahadev Temple, Jagannath Temple, Hadagarh Dam, Handibhanga waterfall, Gonasikha Temple and Kanjhari Dam are some of the tourist attractions located near Khandadhar Falls. The waterfall lies about 19 km from Bonaigarh and can be reached by an extremely poor road. There is no direct public transportation to the waterfall from Rourkela. But one can visit this spot from Bonaigarh Township with Taxi or Auto rickshaw. From the foot hill the waterfall is around 2 km which can only be approachable by foot. The best time to visit here is from September to December. Soochipara Waterfalls, also known as Sentinel Rock Waterfalls, is located inside thick forest near Meppadi town in Wayanad district of Kerala. It is one of the top waterfalls in Kerala and also one of the beautiful waterfalls in India. Soochipara Waterfalls is a 3 tiered waterfall formed over Iruvazhinjipuzha River, dropping from a height of about 200 meter. The waterfall cascades down into a large pool, which is a good place for swimming. This waterfall is surrounded by dense green forests of Wayanad and a 20 minute drive from Meppadi will take you to this splendid waterfall. The route between Meppadi and Soochipara is lined up with beautiful tea estates with a breathtaking backdrop of Chembra Peak. The drive to Soochipara itself is a wonderful experience. 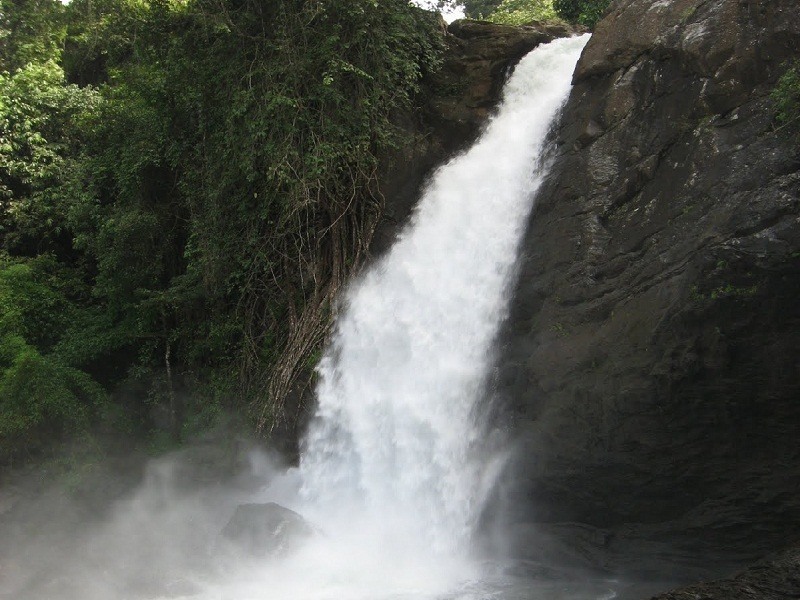 Visitors have to trek down for about 2 km from the road point through slippery and rocky path inorder to reach the falls as part of Wayanad Tour Packages. The trekking is of easy level, which takes about 30 minutes one way. This is one of the best Kerala tourist places to experience the monsoon. The Edakkal Caves, Pookote Lake, Lakkidi, Meenmutty Falls, Thusharagiri Falls, Wayanad Wildlife Sanctuary, Vythiri, Sulthan Bathery and Chembra Peak are the some important tourist attractions near Soochipara Waterfalls. The waterfall would be mostly dry in summer season and usually closed for visitors from March to June. The best time to visit Soochipara waterfall is during monsoon season as one can see the waterfall at its full swing. Lingmala Waterfall is an enchanting waterfall located at top of the Venna Valley near Mahabaleshwar in Satara district of Maharashtra. 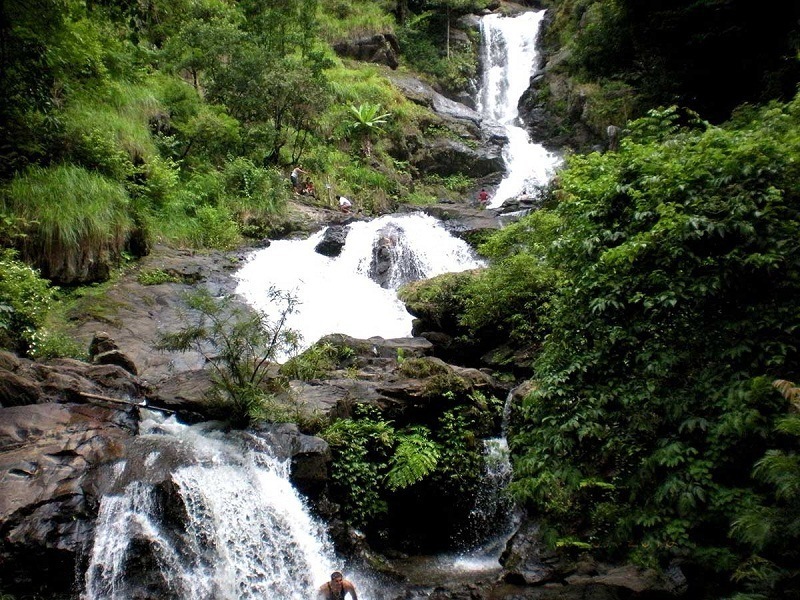 Situated at an altitude of 1278 m, Lingmala Waterfall is formed by Venna River. There are two waterfalls, one mini waterfall and the main waterfall which falls from a height of 500 feet. The mini waterfall is safe & suitable for swimming and playing in the water. One has to walk for 30 minutes to reach the viewpoint of main waterfall from the mini falls. There is no way to get into the water at main falls but visitor can get magnificent views of waterfall from the viewpoint. It is also one of the best tourist places to visit near Pune. This is one of the top attractions you must include in Mahabaleshwar packages. 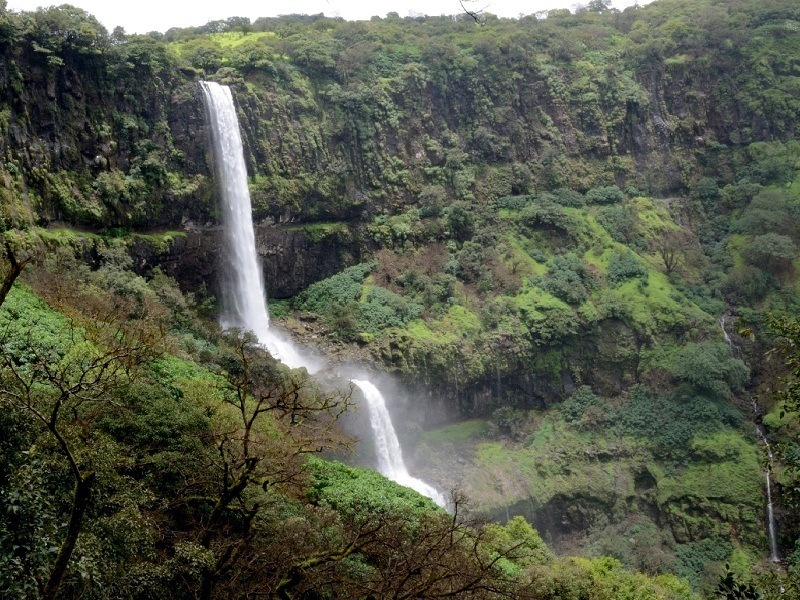 The waterfall is situated on the right hand side of the road while travelling from Mahabaleshwar to Panchgani. From the gate one has to walk for 1.5 km to reach the smaller waterfall and 2.5 km to reach the main waterfall. There are a lot of stairs en route to the lower deck, so the trek can be a bit tiring, but the route and the views are totally worth it. It takes about 30 minutes from the entrance to reach the lower waterfall. Venna Dam, Mahabaleshwar Temple, Krishnabai Temple, Elephant’s Head Point, Lodwick Point, Panchgani, Pratapgad Fort, Dhobi Falls, Chinaman’s Waterfalls and Tapola are some important tourist places near Lingmala Falls. The best time to visit is from July to October, when the waterfall is at its peak flow. The waterfall can be dangerous in rainy season, so it is not at all advisable to swim. 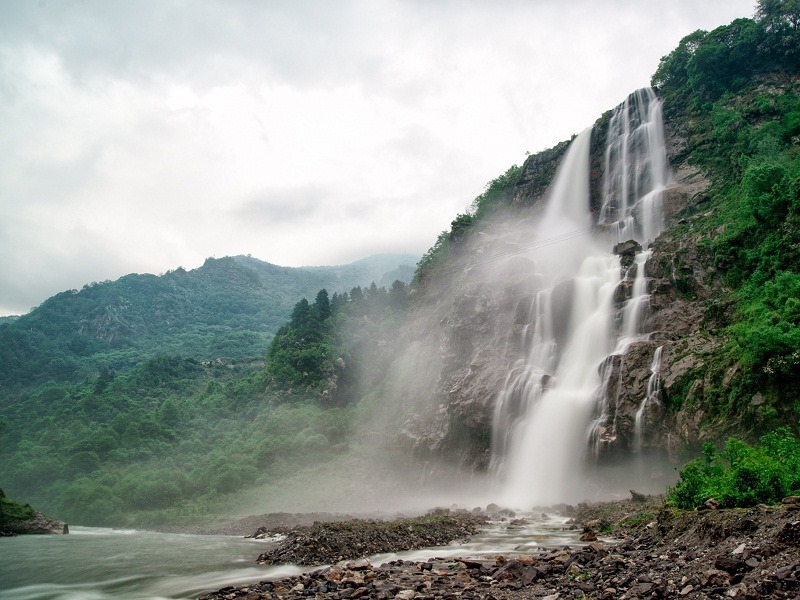 Jogini or Jogni Falls is a beautiful waterfall situated near Manali in Kullu district of Himachal Pradesh. The fall is formed by a stream which is merged in to Beas River in the downstream. It is among popular places to visit in Manali as part of Himachal tour and also one of the best waterfalls in Himachal Tourism. The waterfall cascades down from a height of around 150 feet. There is a small pool at the base formed by the fall and visitors can take a plunge in the water and spend some time. The flow of the water is heavy in monsoons and suggested not to adventure into the water during this time. Jogini mata temple is at the base of the waterfall. It is a sacred site to the surrounding villages. This is one of the top attractions you must include in Manali packages. Jogini Falls is situated on the Northern edge of Vashisht Village & mark the village boundary. The waterfall can be reached by trekking from Vashisht Temple. The trek route passes through a narrow lane adjacent to Vashisht temple and goes through apple orchards, tall pine trees and small water streams. A gentle walk will take 1 hour to reach the base of waterfall. Top point of the waterfall can be reached by a walk of another 15 minutes. This is one of the best short treks in Manali to enjoy local scenic beauty and village life in Himalayas. Hidimbi Devi Temple, Manu Temple, Vashisht Temple, Solang Valley, Rohtang Pass, Tibetan Monasteries, Museum of Himachal Culture & Folk Art, Naggar Castle, Beas Kund Trek, Rahala Falls, Bhrigu Lake Trek, and Deo Tibba Trek are the most popular attraction during Manali Trip. Summer and monsoons are the best time to visit Jogini Falls. Seven Sister Waterfalls is a spectacular waterfall located close to Gangtok in North Sikkim. 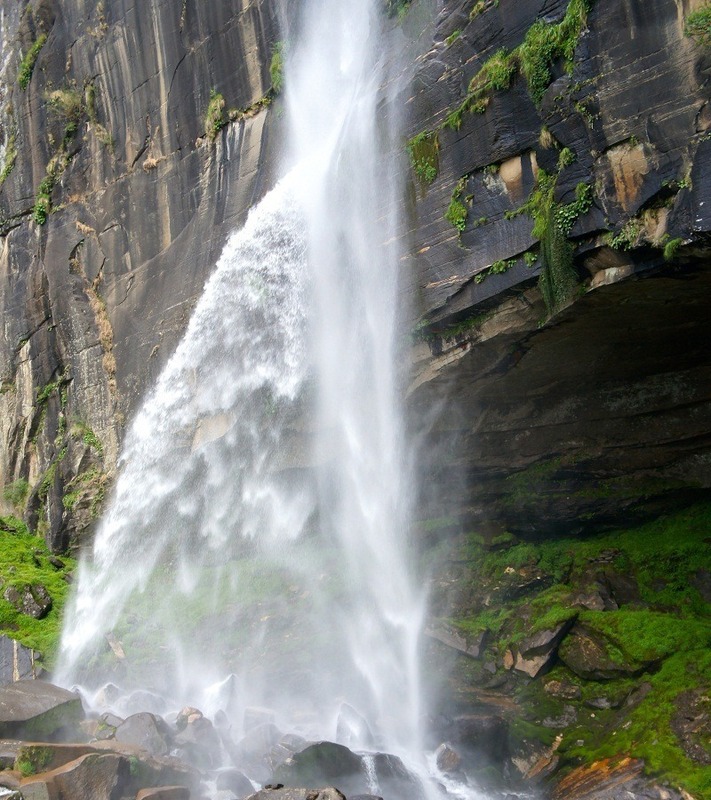 It is one of the must visit places in Gangtok and also one of the famous water falls in India. The waterfall is named so because it is said that water here falls in seven stages. The waterfalls comes alive during the monsoon season. There is a small footbridge across the stream to give the visitors a better view. There are steps that leads to another viewpoint to give a better view of the 4th drop but the other cascades of the falls are not visible from the vantage point. This is another popular attraction not to miss in a Gangtok tour packages. The pristine Seven Sisters Waterfall is situated close to the highway and easily accessible. This is a favorite spot of tourists, photographers, nature lovers as well as the local people. Tourism Department has set up a waiting shed and cafeteria for people to take a break and shoot pictures. Nathula Pass, Hanuman Tok, Namgyal Institute of Tibetology, Enchey Gompa, Himalayan Zoological Park, Ban Jhakri falls and Tashi Viewpoint are some of the major attractions near Seven Sisters Waterfall. Kabi Lungchok is a popular historic site, which is located 17 km north of Gangtok on the way to the waterfalls. Getaways Best Waterfalls in India, India Waterfalls, Monsoon Getaways, Waterfalls in India. permalink.